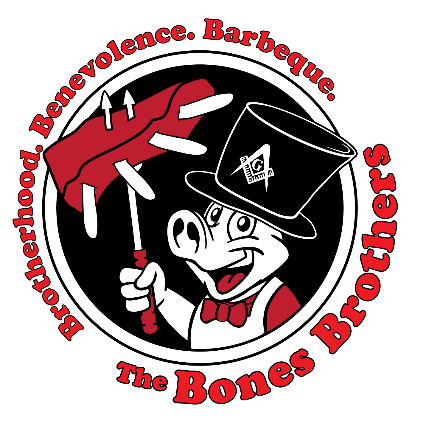 The Bones Brothers was established in 2008 to promote brotherhood at Anoka Masonic Lodge through competition barbecue. While we enjoyed some success as an officially sanctioned KCBS barbecue team, it didn't take long to realize that barbeque was a great way to raise money for those in need. Since 2010, The Bones Brothers have been the main vehicle used by Anoka Masonic Lodge’s Charitable Activities Committee for fundraising events. We have helped countless people living with disabilities, local area homeless youth, cancer patients and their families, and our local food shelf. In addition, we provide assistance and raise funds for other Masonic organizations both within and outside of our Lodge, as well as our Lodge Brothers and their families. We also fulfill our original purpose of promoting Brotherhood through barbecue events. The idea behind the club has been and always will be that good men gather around a barbecue pit.